- cleaning agents containing solvents Do not scrub. - Vehicles with a SmartKey: Do not remove the SmartKey from the ignition lock. Do not open the driver's door or front-passenger door when the engine is switched off. Otherwise, the automatic transmission selects park position P automatically and locks the wheels. You can prevent this by shifting the automatic transmission to N beforehand. - Vehicles with KEYLESS-GO: Do not open the driver's door or frontpassenger door when the engine is switched off. Otherwise, the automatic transmission selects park position P automatically and locks the wheels. Observe the following to make sure that the automatic transmission stays in position N: – Make sure the vehicle is stationary and the ignition is switched off. Use the SmartKey instead of the Start/Stop button on vehicles with KEYLESS-GO. – Switch off the ignition and leave the SmartKey in the ignition lock. - the side windows and the sliding sunroof are fully closed. - the ventilation/heating is switched off (the OFF button has been pressed). - the windshield wiper switch is in position 0. – Do not use hot water and do not wash the vehicle in direct sunlight. – Use a soft sponge to clean. – Use a mild cleaning agent, such as a car shampoo approved by Mercedes-Benz. – Thoroughly hose down the vehicle with a gentle jet of water. – Do not point the water jet directly towards the air inlet. – Use plenty of water and rinse out the sponge frequently. – Rinse the vehicle with clean water and dry thoroughly with a chamois. – Do not let the cleaning agent dry on the paintwork. - door gaps, roof gaps, joints etc. Scratches, corrosive deposits, areas affected by corrosion and damage caused by inadequate care cannot always be completely repaired. In such cases, visit a qualified specialist workshop, e.g. an authorized Mercedes-Benz Center. – Remove impurities immediately, where possible, whilst avoiding rubbing too hard. – Soak insect remains with insect remover and rinse off the treated areas afterwards. – Soak bird droppings with water and rinse off the treated areas afterwards. – Remove coolant, brake fluid, tree resin, oils, fuels and greases by rubbing gently with a cloth soaked in petroleum ether or lighter fluid. – Use tar remover to remove tar stains. – Use silicone remover to remove wax. - magnetic plates or similar items to painted surfaces. You could otherwise damage the paintwork. If dirt has penetrated the paint surface or the paint has become dull, the paint cleaner recommended and approved by Mercedes- Benz should be used. – Use a suitable touch-up stick, e.g. MB Touch-Up Stick, to correct smaller areas of paint damage quickly and provisionally. - Vigorous rubbing with unsuitable materials. - Frequent use of car washes. - Washing the vehicle in direct sunlight. Never use paint cleaner, buffing or polishing products, or gloss preserver, e.g. wax. These products are only suitable for high-gloss surfaces. Their use on vehicles with matte finish leads to considerable surface damage (shiny, spotted areas). Before cleaning the windshield or wiper blades, switch off the windshield wipers and remove the SmartKey from the ignition lock. On vehicles with KEYLESS-GO, press the Start/Stop button repeatedly until all indicator lamps in the instrument cluster have gone out. The windshield wipers could otherwise move and injure you. – Clean the inside and outside of the windows with a damp cloth and a cleaning agent that is recommended and approved by Mercedes-Benz. – Fold the wiper arms away from the windshield. – Carefully clean the wiper blades with a damp cloth. – Fold the windshield wipers back again before switching on the ignition. – Clean the plastic lenses of the exterior lights with a wet sponge and a mild cleaning agent, e.g. Mercedes-Benz car shampoo or cleaning cloths. Only use cleaning agents or cleaning cloths which are suitable for plastic light lenses. Unsuitable cleaning agents or cleaning cloths could scratch or damage the plastic light lenses. – Clean sensors 1 of the driving systems with water, car shampoo and a soft cloth. When cleaning the sensors with a power washer, maintain a distance between the vehicle and the nozzle of the power washer of at least 11.8 in (30 cm). Information about the correct distance is available from the equipment manufacturer. – Use clear water and a soft cloth to clean camera lens 1. The ball coupling must be cleaned if it becomes dirty or corroded. – Remove rust on the ball of the ball coupling, e.g. with a wire brush. – Remove dirt with a clean, lint-free cloth or a brush. – After cleaning, lightly grease the ball of the ball coupling again. – Check that the vehicle's trailer tow hitch is working properly. Observe the note on care provided by the trailer manufacturer. You can also have the maintenance work on the ball coupling and the trailer tow hitch carried out by a qualified specialist workshop. Environmental note Dispose of rags soaked in oil and grease in an environmentally responsible manner. – Before cleaning the display, make sure that it is switched off and has cooled down. – Clean the display surface using a commercially-available microfiber cloth and TFT/LCD display cleaner. – Dry the display surface using a dry microfiber cloth. Please do not forget that your primary responsibility is to drive the vehicle. A driver's attention to the road must always be his/her primary focus when driving. For your safety and the safety of others, stop before trying to remove window fogging or cleaning the window in front of the Night View Assist Plus camera. Bear in mind that at a speed of just 30 mph (approximately 50 km/h), your vehicle is covering a distance of 44 feet (approximately 14 m) every second. – Fold down the camera cover by recess 1. – Use a soft cloth to clean the windshield in front of camera 2. When cleaning the steering wheel boss and dashboard, do not use cockpit sprays or cleaning agents containing solvents. Cleaning agents containing solvents cause the surface to become porous, and as a result, plastic parts may break away and be thrown around the interior when an air bag is deployed, which may result in severe injuries. - scented oil bottles or similar items You can otherwise damage the plastic. – Wipe the plastic trim with a damp, lint-free cloth, e.g. a microfiber cloth. – Heavy soiling: use car care and cleaning products recommended and approved by Mercedes-Benz. – Thoroughly wipe with a damp cloth or use leather care agents that have been recommended and approved by Mercedes- Benz. – Wipe the wooden trim and trim pieces with a damp, lint-free cloth, e.g. a microfiber cloth. Observe the following when cleaning: - clean genuine leather covers carefully with a damp cloth and then wipe the covers down with a dry cloth. Make sure that the leather does not become soaked. It may otherwise become rough and cracked. Only use leather care agents that have been tested and approved by Mercedes-Benz. You can obtain these from a qualified specialist workshop, e.g. a Mercedes-Benz Service center. - clean artificial leather covers with a cloth moistened with a solution containing 1% detergent (e.g. dish washing liquid). - clean cloth covers with a microfiber cloth moistened with a solution containing 1% detergent (e.g. dish washing liquid). Rub carefully and always wipe entire seat sections to avoid leaving visible lines. - clean Alcantara® covers with a damp cloth. Make sure you wipe entire seat sections to avoid leaving visible lines. – Use clean, lukewarm water and soap solution. Do not clean the seat belts using chemical cleaning agents. Do not dry the seat belts by warming them above 176 °F (80 °C) or placing them in direct sunlight. 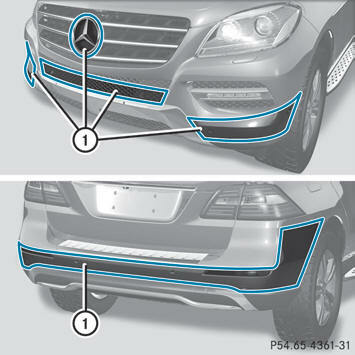 – Headliner: use a soft brush or a cleaning agent recommended and approved by Mercedes-Benz to remove heavy soiling. – Carpets: use the carpet and textile cleaning agents recommended and approved by Mercedes-Benz.